The goal of the SSR computation module is to compute the orbits and clocks corrections that are necessary for the PPP (user side), and to encode these corrections in a well-defined standard (here the RTCM 3.1 standard). This module mainly uses as input the real-time measurements provided by a GNSS network, the computation is done by means of a Kalman filter. 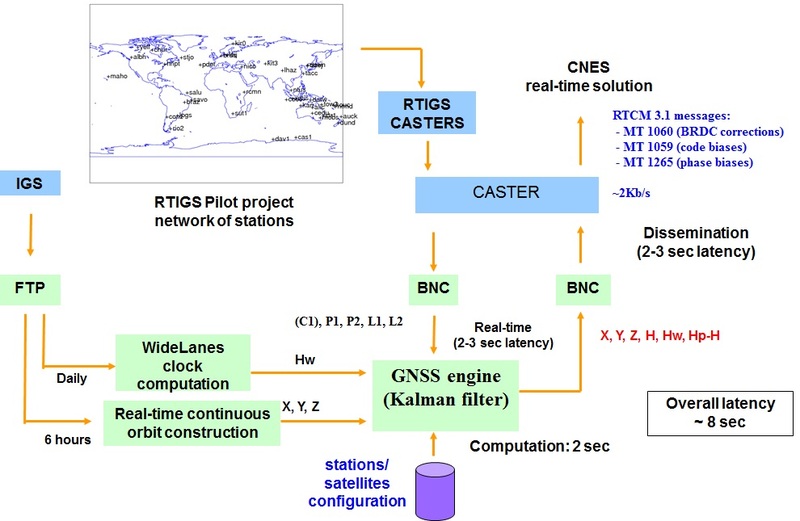 The SSR computation module relies upon a real-time GNSS networks of stations, made available to CNES thanks to its participation to the real-time IGS pilot project. Indeed, one of the goal of this pilot project is to collect and broadcast in real-time the measurements of some of the IGS network of GNSS stations. The GFZ caster, which proposes more than 80 streams. The NrCan caster, which proposes some additional streams. The CNES own caster, which proposes streams operated by CNES. In addition to the real-time measurements, the SSR module uses a daily interface with the IGS to recover the measurements necessary for the widelane clock computation. Another IGS interface allows to recover ultra-rapid IGU orbits to feed the Kalman filter. The ouput of the filter contains mainly the corrected orbits and the complete set of clocks (widelane, pseudo-range and phase), that are sent to the caster with the BNC software.